After two-and-a-half months of protest and six farmer deaths, the kisan Sangharsh Samiti (kss), a farmers' group in Sriganganagar district, Rajasthan, has called off its agitation. 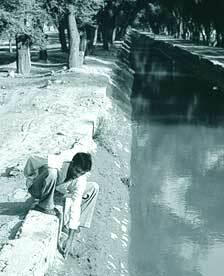 kss was protesting about the lesser water they felt they were allocated via the Indira Gandhi Canal (igc) this year. Apparently, "all" of their demands regarding their share of water from igc have been accepted by the Bharatiya Janata Party-led state government. On October 27, four farmers had died after a group of farmers attacked village Rawla police station and the police fired on them. This attack was the effect of a lathicharge, the day before, on farmers at village Ghadsana. (see 'Farmers' uprising in Rajasthan', Down To Earth, November 30, 2004, p 15-16). The casualties rose to six when a farmer succumbed to injuries received at the Ghadsana lathicharge; another lost his life in a demonstration at Khajuwala. The announcement to call off the agitation came after a written agreement signed between kss leaders and the state government at Ajmer on December 11, 2004. Sahib Ram Punia, Vallabh Kochar and Hetram Beniwal signed for kss. S N Thanvi, secretary, irrigation, put his signature to the agreement on behalf of the government. It is one thing to put a signature on paper. It is quite another to actually fulfil the farmers' demands. A look at the agreement reveals, immediately, two grey areas. A grey area The government has accepted that the amount of water distributed between the first and second phase of the Indira Gandhi Nehar Project should be in the same ratio as before (most of the protesting villages fall within the first phase. Now that the second phase has been developed, farmers had felt that water was being distributed there at their cost). Such distribution should, farmers want, be done only at Harike Barrage only (the source of igc water). But it has not guaranteed that the ratio will not be changed in the future. Another one Who should bear the water loss caused when water flows from Harike Barrage to rd-620 (the point from where the first phase gets water)? Farmers want this loss to be distributed between both phases. But the agreement has completely ignored this. Also, government willingness to provide extra water for the Rabi season is old hat, accepted two months ago! Another demand acceded: a change in managing distributaries. Earlier, this was the work of the area divisional commissioner. "Now, chief engineer (north) will mange these distributaries," says Shivcharan Regar, executive engineer (regulations), irrigation department, north. But will it benefit farmers? "I don't think so," Regar says. The government response is timely. But was it merely to put the lid on an agitation boiling through the region? Will they now act?